The fixtures for next season were released today and the R's kick off with a home game against Ian Holloway's, Blackpool. This is followed by two long trips to Exeter and Plymouth respectively. Although when you take a look, the fixtures computer has been reasonably kind to the QPR supporter this time around, especially the away followers amongst us, with all the midweek aways within reasonable distance and a rare home Boxing Day fixture. The only real disappointment is that the eagerly awaited trip to Newcastle is to take place on Wednesday 30th September. 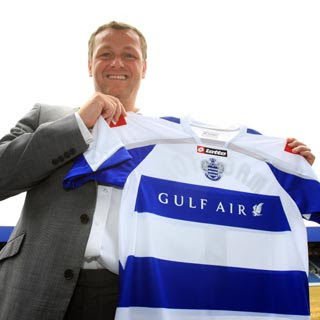 QPR yesterday appointed John Gorman as their no 2 to new Manager, Jim Magilton. 'I am honoured at being given this exciting opportunity and I thank the Club's management for choosing me. QPR has plenty of history and a big following. I know most of the players and have great respect for them. I rate them highly and look forward to working with such good players. GOOD LUCK JOHN and WELCOME to QPR!!! QPR face a tricky opening round and will make the long trip down to League One, Exeter City in the first round of the Carling Cup. The tie will be played in the week commencing August 10th 2009. QPR have today confirmed the appointment of former Ipswich Town boss, Jim Magilton as their new manager on a two year contract. "We had an incredibly high number of applicants but Jim was the stand out candidate for the role. We sat down with him on four separate occasions over the last month to discuss our goals and ambitions and he has really impressed myself, Mr Ecclestone, Mr Mittal and Mr Bhatia with his knowledge, understanding and passion for football. He did a very good job at Ipswich Town playing some fine, attacking football and he has ambition to achieve in this next chapter of his career. We are all really looking forward to working with him"
"I am really looking forward to the challenge of managing this great football club. The board are highly ambitious but they are realistic at the same time. I have huge ambitions to succeed as a manager though and our aim is to keep progressing year after year. There is a very strong group of players at the club and with one or two additions over the summer we can expect to be in a position to drastically improve upon the eleventh placed finish secured last season"
It is pleasing to hear that Magilton will retain Gareth Ainsworth as part of his coaching staff, but is rumoured to be keen on former Wycombe manager John Gorman as his assistant. Okay, so maybe a surprise choice for many and not the big name we all had hoped for? But be honest, who else would want to come to QPR at the moment?? And for that, I will give my full support and I wish Jim Magilton all the VERY best of luck, your gonna need it!! GOOD LUCK JIM and WELCOME to QPR!!! The 'Worldie' is Not Enough..
Late Heartbreak as the Points Go For a Barton.. Same Outcome with the Same Old Excuses..
No Cup Shock as R's are Cut to Shreds by Blades..